From a conventional cream whipper modified to supply new applications, since 1994 Ferran Adria(El Bulli, Girona) has been developing a technique for making foams and preparing sauces of all kinds. From a conventional cream whipper modified to supply new applications, since 1994 Ferran Adria (El Bulli, Girona) has been developing a technique for making foams and preparing sauces of all kinds. 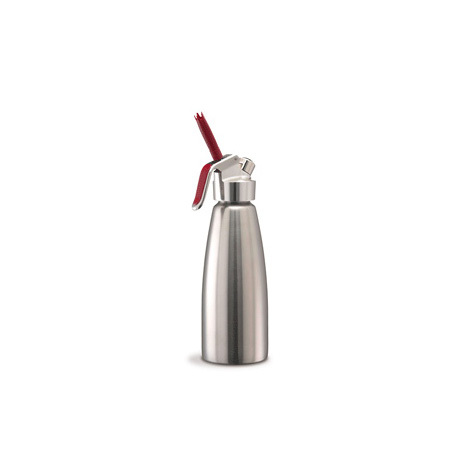 The Gourmet Whip syphon is a cream whipper to which air is added by means of compressed air capsules. Thanks to that simple principle we can turn practically any mixture into foam, sweet or savoury, cold or hot. It is all a matter of filling the syphon with the desired mixture, screwing on the top, loading it with the air capsules, shaking it, leaving it to rest in the refrigerator or bain marie, and our foam is ready for tasting.